An accomplished and internationally known particle physicist, Hildreth brings his research expertise to the undergraduates. Hildreth has advised 22 Notre Dame undergraduate researchers and those students who have already graduated from Notre Dame have gone on to attend top graduate programs. He has also advised 28 summer research students and five Ph.D. students. Focusing exclusively on introductory physics education, Hildreth has brought innovation and passion to the science classroom since his first year at Notre Dame in 2000. His classes include a combination of teaching, mentoring, peer-learning, and designing your own experiment. “My mission is to act as a catalyst to bring new techniques and methods to the classroom,” Hildreth said. During his acceptance speech, Hildreth showcased a few of his teaching techniques to the audience. Whenever he presents material that the students may not find as interesting, he wears fun hats to help keep them interested in the discussion. For this occasion, Hildreth donned a purple toque, which is part of the academic regalia of the Sorbonne in Paris and was loaned to him by Rev. Michael Driscoll, C.S.C., associate professor of theology at Notre Dame. Hildreth also illustrated the importance of showing the real life application of concepts and theories by demonstrating a consequence of conservation of angular momentum to the luncheon guests. He placed a small amount of rubbing alcohol on a small rotating platform and set it on fire. He then asked the group if the flame would either extinguish, get smaller, or become larger once the platform was spun. Then he spun the platform and showed that the flame gets larger with the increasing angular speed, resulting in a vortex of flame. 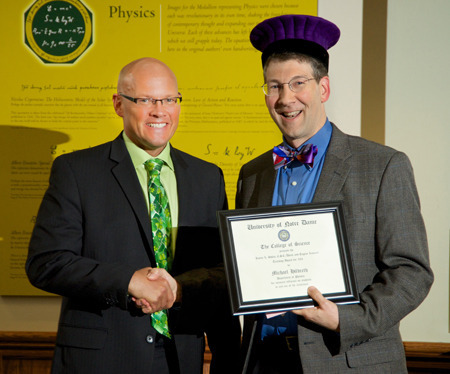 Hildreth has been recognized for excellence in teaching throughout his time at Notre Dame. He received a Rev. Edmund P. Joyce, C.S.C., Award for Excellence in Undergraduate Teaching in 2008 and earned the 2010 Thomas P. Madden award as the outstanding first year professor. 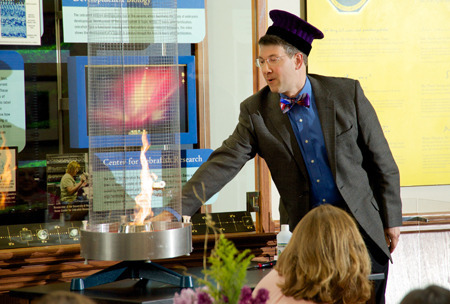 Originally published by Stephanie Healey at science.nd.edu on May 19, 2014.